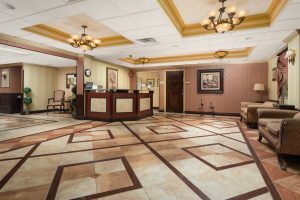 Marquis Health Services Launches Branded Guest Services Program at Oakland Rehabilitation & Healthcare Center in Oakland, N.J.
OAKLAND, N.J., Aug. 2, 2018 – Oakland Rehabilitation & Healthcare Center has become the first Marquis Health Services member to incorporate a newly branded, hospitality-focused Guest Services program. Offering a wide range of concierge-style support and personal services, the initiative aims to elevate lifestyle and convenience for residents at the 215-bed skilled nursing facility. Marquis Guest Services provides a range of elevated services. This includes assistance with errands, such as pick-ups from local grocery and department stores; help with banking needs; coordination of pet visits; connections for personal spiritual and pastoral support; and planning for family gatherings and celebrations. Guest Services also offers on-site barbers, beauticians and manicurists on a regular basis. This summer, Oakland Rehabilitation & Healthcare Center also introduced telemedicine service through national provider TripleCare. Providing virtual access to a network of experienced physicians, this high-tech offering complements residents’ regular bedside physician visits. By offering support 24/7, the service is intended to help treat patients in place and aid in reducing hospital transfers. The augmented lifestyle and healthcare offerings follow Marquis Health Services completing a $3.5 million property renovation at Oakland Rehabilitation &Healthcare Center. Located at 20 Break Neck Road, the facility offers sub-acute rehab, dementia care and long-term care wings, and specializes in cardio pulmonary and orthopedic rehab. Oakland Rehabilitation & Healthcare Center achieved a five-star rating in U.S. News and World Report’s 2017 “Best Nursing Homes,” marking its second consecutive top-performer rating. The facility has a five-star rating from the Centers of Medicare & Medicaid Services (CMS) as well. Marquis Health Services is a recognized leader in providing subacute rehabilitation and skilled nursing care. The company currently operates 10 skilled nursing properties in the Mid-Atlantic region – with locations in New Jersey, Pennsylvania and Maryland. The organization’s growing portfolio also includes 10 facilities in New England. Marquis Health Services’ facilities achieve consistently high scores in state health inspections, and accolades for the nursing and therapy staffs. Today 75 percent of the Marquis Health Services portfolio has received four- and five-star ratings for outstanding care. Marquis Health Services is the healthcare affiliate of Tryko Partners, LLC, a family-owned organization with three generations of skilled nursing involvement. The private equity investment group also purchases multifamily properties and tax liens along the Eastern Seaboard and in the Midwest. Tryko Partners maintains an outstanding reputation as an operator, developer and property manager.